Very basic. Clean, comfortable beds, but misleading photos. No whirlpool bathtub. Photos show 2 single beds & 1 double/queen - gives you impression from those photos that it’s a two bedroom, but it’s not. The (one) single bed was in lounge room.... and hard to sleep with big triangular window at top that had no curtain where light shone in. Room not serviced once during our 5 nights but I thought they said they would? Views are million dollars. Staff nice. I would only recommend this property on the condition that you make sure they give you the room you pay for. We were exhausted from flying and had things on each day so were busy enjoying holiday.. and as it was 2 of us we fit in apartment so didn’t think much of it...wasn’t until I looked closely at the booking that I realised. But it shouldn’t happen - I felt a little ripped off to be honest. If someone could explain that it’d be super. Apart from that nice stay. You’ll be fit after your stay with the steep hill. We loved it. Ideal location with fantastic views. The apartment was very clean and fully equipped. We will recommend this place for a few days days stay in Queenstown,. The staff is very helpful. Like the view and very tidy! Would choose again if I come to Queenstown again! Everything is perfect and the only con (if have to state one) will be a steep slope to climb to reach this place. 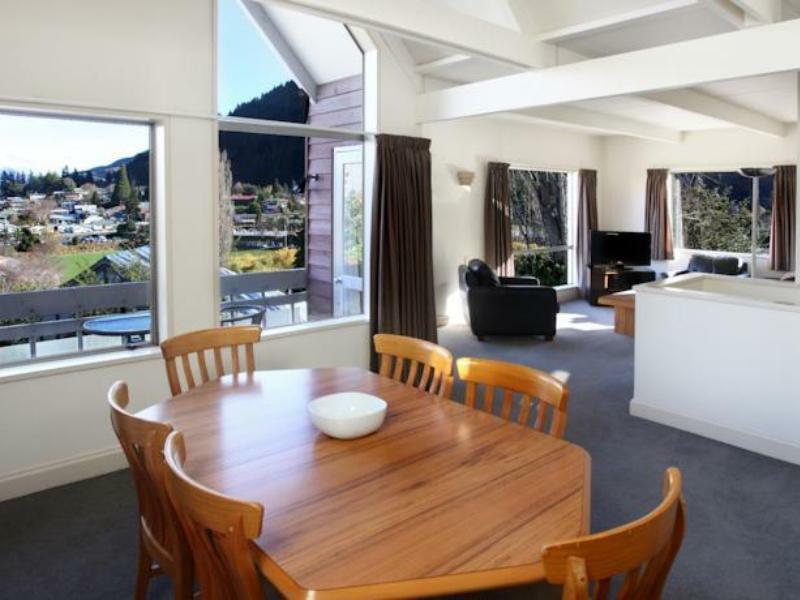 Queentown is at 10min walking distance with good choice of restaurants and supermarket. Free parking is avail for 1 lot per unit. We stayed in 3 stories unit with 1st level just a store room and stair, 2nd level are 2 bedrooms + 1 bathroom while level 3 is the kitchen and living room. 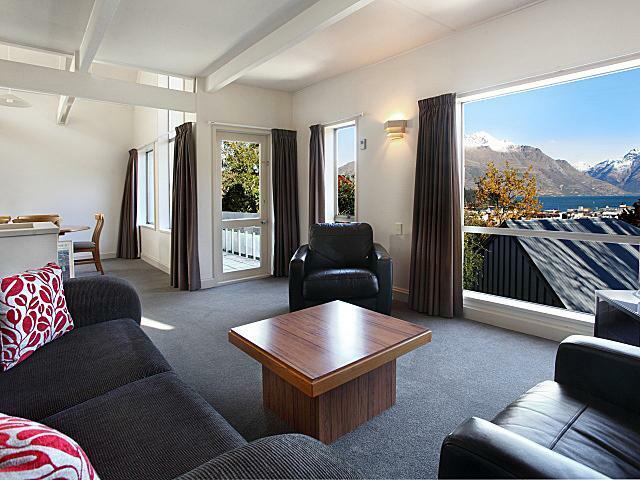 The view at 3rd level is super (facing Lake Wakatipu) if not is perfect that we wish we can stay longer to enjoy. Staff is very helpful too. Nice and spacious two storey townhouse (though this means you will have to bring your luggages up and down the stairs) with sky tv, WiFi, cooking facilities and balcony where we had our meals. Location is up a steep hill so that gets a little tiring. Given the price tag, surprised there is no air conditioning or fans provided given the warm summer days and nights. Nice and cozy rooms ,well maintained. Had a bath and other two couldn't even have a shower. not a big hot water tank... no rubbish bin in rooms. otherwise great place to stay. Recommended. Loved every minute of my stay. Fabulous view , and a lovely comfortable room. We were upgraded to a 2 bedroom. Huge apartment with amazing views. Immaculately clean with everything you could possibly need. Raelene was very friendly and very helpful. Good lake view from units, location close to town and gondola station, good wifi connection. Had a pleasant 3-night stay. Staff very helping, giving very good advice in different tour options and helped in booking tours too, thank you very much for that. The apartments are on a steep street, though only a few minutes walk, still make one rather exhausting pulling the luggage up the hill if not renting a car. Spent 4 wonderful nights at this townhouse. Children loves the townhouse layouts and design.